Two homes for the price of one! Come see the architechts own dream home, horse property and 1400 sf guest house! (Rental income up to $1900 per mo!) See the original blueprints. This horse property is in turn-key condition and sits on 2.4 completely fenced acres. It is served by a new 14.070 KW-42 panel Solar System, owned and large enough to completely power both houses pool/spa and an electric car. No CCR's, Mella Roos or electric bill! The guest home is perfect for extended family or rental income!, Huge price drop! Two homes for the price of one! Come home to the architect's own custom dream home, horse property and guest house. See the original blueprints on site. This house is in turn-key condition and sits on 2.4 completely fenced acres. This is horse property. It is served by a new 14.070 KW-42 panel Solar System, owned, not leased and large enough to completely power both houses and an electric car with power left over. Built in 1990, the main house has 3113 square feet and boasts soaring ceilings that average 10 feet with light and bright filled rooms. 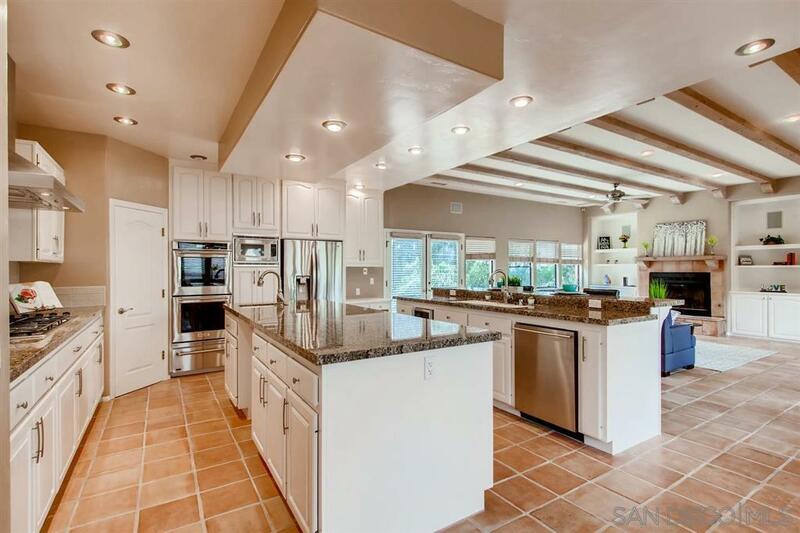 Reconditioned Pastel Saltillo tile floors serve most rooms of this Mediterranean style home. There is new stain resistant carpet in the bedrooms, and french doors open to the outside patio entertaining areas off the living room, family room, and master bedroom. The living room features a wood burning fire place and cathedral ceiling. The formal dining room can seat a large crowd. The extra-large kitchen offers a six burner Thermador range, generous size pantry, two islands, a prep sink, a new double oven and range hood, an area for casual family dining, and bar seating for four. The open concept family room adjacent to the kitchen has new Saltillo floors for easy maintenance, and a wood burning fireplace. The main house has four bedrooms, each with an attached bath. The master bath has a soaking tub and huge shower. The master bedroom also has a fire place and two walk-in closets. The guest bedroom has an attached bath, and the secondary bedrooms share a Jack and Jill bath. There is also a powder room for guests. Storage abounds in this house, with walls of cabinets in the kitchen and laundry room, and extra storage in the family room, and cabinets lining the halls approaching the bedrooms. The 3-car attached garage is 1144 square feet, or 4.5 car size! It includes a bonus room that has been used as an office, work-out room, music room, and just storage space. There is additional driveway parking outside the garage for several cars. The house is air conditioned, and features a central alarm system. The pool area offers a tiled barbeque island with grill, side burners, griddle, refrigerator and bar seating. The horse facilities feature several pens and turn outs with covers and adjustable fencing. There is a two-stall barn with hay storage, and an area for parking a horse trailer or RV. The wonderful 1410 square foot guest house has a separate address, and could be used for extended family, or as a rental. It is in perfect condition and features two master bedrooms with en-suite baths, and living room with fireplace. The property is completely fenced and private with no close neighbors. The outdoor area with pool and BBQ are ideal for entertaining and the views of this house are incredible. Beautiful ocean views can be seen on clear days. This house is perfect for anyone needing horse property, a guest home and estate style living. You have to see it to believe it.